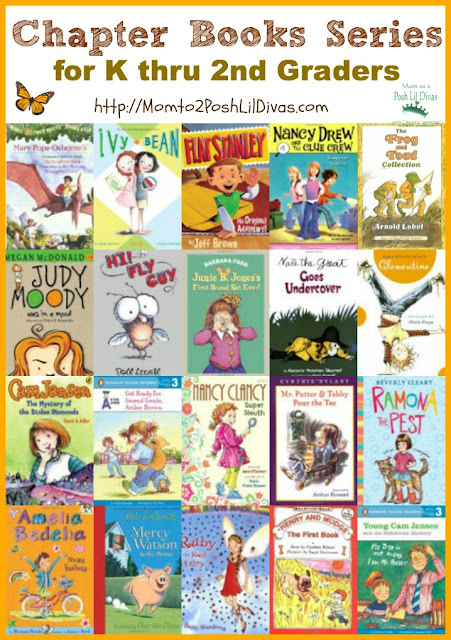 Google+ Mom to 2 Posh Lil Divas: K thru 2nd Grade Chapter Book Series - Our 20 Favorites! K thru 2nd Grade Chapter Book Series - Our 20 Favorites! Today, I wanted to share some of our favorite chapter books series in honor of Children's Book Week. The Lil Divas truly look forward to reading the books in these series. Before you explore the list below, I want you to keep in mind that reading abilities do vary in children, especially in the early primary grades. Some of the books I may suggest may be too difficult (or possibly even too easy) for your Kindergarten thru 2nd Grader. I also want to remind you not to steer your child away from chapter books simply because they are not 100% ready to tackle a chapter book independently. Even if your child is only reading easy readers, chapter books can be a part of their reading experience. How? You can read them aloud with your child. It's a wonderful opportunity to introduce children to chapter books and enjoy them together. The Lil Divas do NOT read the books I have listed below 100% independently. I always sit with them and have them read to me or we alternate pages and read together. This gives us the opportunity to discuss the book, it allows me to help if they get stuck on a word and I can also readily see if a book is either too easy or too hard for them. Disclosure: This post contains Amazon affiliate links. I receive a small commission for any items purchased through the links provided. We love Mrs Piggle wiggle too! Thank you SOOOO much for suggesting this! I have been trying to remember Mrs Piggle Wiggle name for YEARS!! I loved her series sooo much as a child! Thanks again I am now buying up her books as I type lol! Thanks again so much! The Roscoe Riley Series is relatively new. My children and I love the stories. I was also going to add the Mrs. Piggle Wiggle series! Great list! We just finished reading Junie B's kindergarten year. My daughter loves her! Next up... Magic Tree House! DD7 loved the Candy fairy series too and the Disney Princess and Fairies chapter books too. We are moving to a new phase now with the recent discovery of American Girl! Any book by Arnold Lobel! My daughter is a very big fan of many of these, especially Judy Moody, Junie B, Nancy Clancy, Amelia Bedelia, and Cam Jansen. She also love several new series like the Heidi Heckelbeck books and the Never Girls books (which is a spin off of the Disney Fairy books). And Princess Posey is also a new favorite. Great list! I would also add The Boxcar Children. TONS of books in the series. We have really enjoyed the following as read alouds Lighthouse Series by Cynthia Rylant, Cobble Street Cousins Series by Cynthia Rylant, Henry and Mudge series by Cynthia Rylant, Daisy Dawson series by Steve Voake, My Father's Dragon series by Ruth Gannett and Mr. Popper's Penquins. My 2nd graders love the "My Weird School" series!! Billie B Brown series by Sally Rippin (I noticed someone has already mentioned Hey Jack). These books are going like hot cakes with our Grade 1 and 2s. My girls love the Anna Hibiscus series by Atinuke. I love it too! I am reading aloud the Little House series and the Chronicles of Narnia series to my 7 year old--he loves them. Awesome list! I'm so glad you added that some of the books may be too hard or too easy for the reader...it depends on the child! I'm a 2nd grade teacher and the kids are so excited to be reading 'chapter' books! Thanks so much for sharing! Great list! We've been reading the Polk Street School books (that I read as a child, too) and the Choose Your Own Adventure series. She loves picking what happens next! Love the list!! I started reading Junie B Jones with my now 4th grader who is reading Dork Diaries now. I'm going to start the Mercy Watson series with my kindergartner, it looks hilarious.